Nachos are an easy crowd-pleaser that are super tasty and quick to make. This version is vegetarian, although delicious when served with pan fried spicy chorizo, shredded roast chicken meat or strips of grilled steak. Perfect for a midweek meal, sporting bash or a DIY family dinner that everyone will love! Also, you can serve it with guacamole when avocados return to a reasonable price! Add McCain Corn Kernels, tomatoes, beans, coriander, red onion and lime juice to a medium mixing bowl, stir well to combine and set aside. Scatter corn chips or tortilla crisps evenly in a large oven proof dish, top with jar of tomato salsa, sprinkle with tasty cheese and place under a hot grill for 3-5 minutes or until cheese is golden and melted. 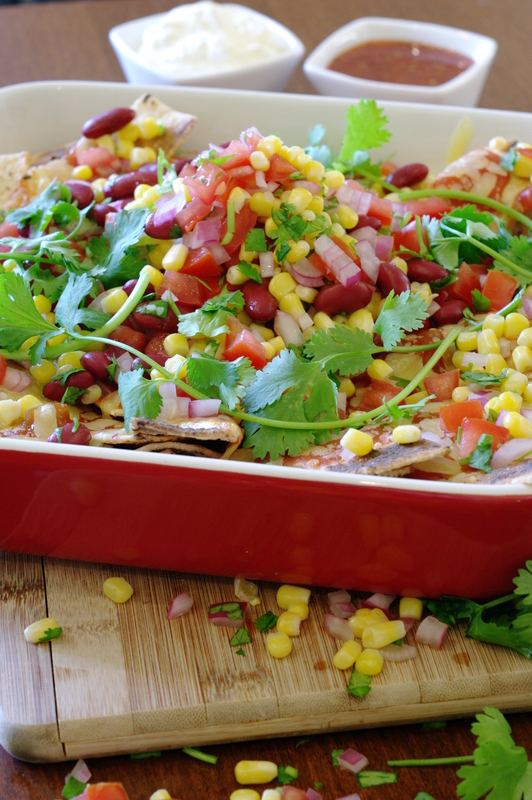 Remove chips from grill and top with McCain Corn Kernel salsa. Serve immediately with sour cream, sweet chilli sauce and garnish with coriander sprigs. Thank you! They were so tasty – the lime in the salsa made then so fresh.